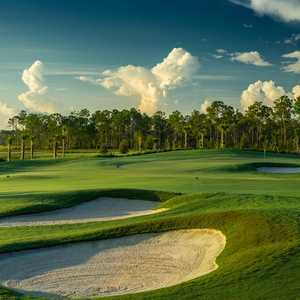 NAPLES, Fla. -- The scorecard of The Golf Lodge at The Quarry looks daunting. The par-3 15th hole at The Golf Lodge at The Quarry plays over water. Water appears to splash everywhere on this interesting Michael Hurdzan-Dana Fry design that opened in 2007. But rest assured this private golf club plays gentle and forgiving as long as players chose their clubs and angles of attack wisely. Big greens and wide fairways keep the ball on track most of the time. Just ask the Champions Tour players. 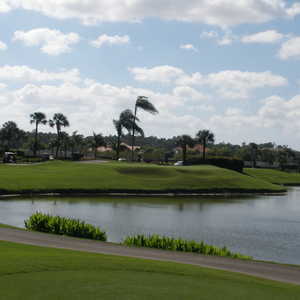 The 7,316-yard Quarry hosted the over-50 crowd for the 2010 and 2011 ACE Group Classic. Rough weather caused the scoring average to balloon over par (73.053) in 2010, but in ideal conditions during the final round, champion Fred Couples made eight birdies and Tommy Armour III shot a course- and tournament-record 61 to nearly overtake him. Just a year later, the players boasted a much lower scoring average (70.893). Winner Bernhard Langer shot a tournament-record, 20-under par to win the tournament, beating Fred Funk by four shots. The players generally had nothing but praise for the course. Peter Jacobsen made a hole-in-one on the par-3 second with an 8-iron before the tournament. "I think it's a really good golf course. Very playable," Jacobsen told a local paper. "It's got some length," added Allen Doyle. "It's a big, wide golf course." The course never really utilizes the 320-acre Stone Lake that was created from an old limestone quarry. This lake is the centerpiece of the gated real-estate development, but there are plenty of other water hazards along the way. The 364-yard first hole eases players into the round, although left is wet. The par 5s -- Nos. 3, 7, 12 and 14 -- rank among the four highest handicap holes on the course, something you don't see too often in the modern era of reachable par 5s. The shortest par 5 (No. 12) runs 523 yards from the tips. The signature moment comes at the all-carry tee shot of the par-3 15th, sparking a fine finish. The short 16th, the easiest hole, can be a drivable par 4 depending upon the tees you play. 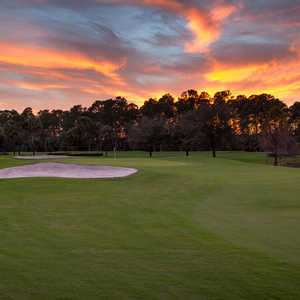 Two brawny par 4s, the 436-yard 17th and the 456-yard 18th, ends the round in the shadow of the Golf Lodge, aka the clubhouse. The Golf Lodge doesn't house any accommodations, yet its sheer size and creature comforts give it a resort ambiance. The fireplaces and stone and wood decor and southern-style porch are a classy touch. The Golf Lodge at The Quarry is mostly private, but if you're staying at a higher-end hotel or resort have the staff there call to check course availability. It's always nice to tee it up on a scenic Champions Tour venue.